02.08.2018 12:43:28 - Elastically deformable plastics are necessary for many technical applications but also for various everyday objects. Per year, more than 12.7 million tonnes of these types of polymers are consumed worldwide. (live-PR.com) - Ceresana analyzed the global market for synthetic rubbers already for the third time. These include styrene-butadiene rubber, butadiene rubber, ethylene-propylene-diene rubber, acrylonitrile-butadiene rubber, chlorobutadiene, and polyisoprene. The current study deals with data for the years starting in 2009 and forecasts data until 2025. 58% of total global demand were accounted for by applications in original equipment and replacement tires. Rubbers are also used for numerous other products in the automotive industry: for example for hoses, cables, seals as well as window and door profiles. For the automotive segment, the analysts of Ceresana expect an increase of global rubber demand by 3.0% per year until 2025. The second largest application area for rubbers are elastically deformable engineering products with a stable shape such as conveyor belts, roll covers, hoses, profiles, seals, cables, molded parts, and roofing films. Ranging from the chemical industry, engineering, and construction to electrics and electronics, increasing number of rubber products are needed. For the period until 2025, we expect global demand for rubber in the segments industry and construction to increase by 2.4% p.a. By far, the most important rubber type is styrene-butadiene rubber (SBR): about 5.1 million tonnes were processed in 2017. SBR is produced by emulsion polymerization (E-SBR) or solution polymerization (S-SBR). While E-SBR accounts for approx. 72% of total SBR demand, the market for S-SBR develops at significantly more dynamical growth rates of 3.8% p.a. The tire industry is the dominating sales market for these two products as well as for butadiene rubber (BR), butyl rubber (IIR), and polyisoprene (IR). A different picture is presented in the case of ethylene-propylene-diene rubber (EPDM), chlorobutadiene rubber (CR), and acrylonitrile-butadiene rubber (NBR): These rubber types are mainly used in industrial and construction products as well as for modification of other materials. Chapter 1 provides a description and analysis of the global rubber market, including forecasts up to 2025: The development of revenues, demand, and production is analyzed for each region of the world. Chapter 2 offers a detailed analysis of 25 countries: Demand, export, import, production, capacities, and revenues in regard to rubber. In addition, these countries are also analyzed regarding application areas. Market data on demand are split by types of rubber for each country. 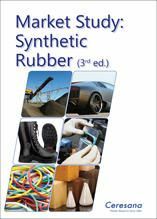 Chapter 3 analyzes the different types of application areas of rubber in detail: Data and influential factors on application in tires, automobiles, industry and construction products, modification of materials as well as other applications. Chapter 4 analyzes demand for rubbers split by the types styrene-butadiene rubber (E-SBR), styrene-butadiene rubber (S-SBR), polybutadiene rubber (BR), ethylene-propylene-diene rubber (EPDM), butyl rubber (IIR), acrylonitrile-butadiene rubber (NBR), polychloroprene rubber (CR), and polyisoprene rubber (IR). Chapter 5 offers a useful directory of the 67 most important rubber producers, clearly arranged according to contact details, revenues, profit, product range, production sites, profile summary, and information on capacities. The most important manufacturers include: Arlanxeo Holding B.V., ExxonMobil Chemical Company, Goodyear Tire & Rubber Company, JSR Corporation, Korea Kumho Petrochemical Co., Ltd., Nizhnekamskneftekhim JSC, PetroChina Company Limited, China Petroleum & Chemical Corp. (Sinopec Corp.), Synthos S.A., and Versalis S.p.A.